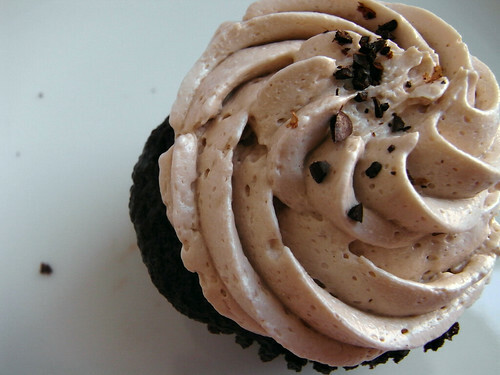 We like this cupcake from Oro Bakery because it's less like the iconic American cupcake with the sugary frosting, and more like a simple cake with a side of whipped cream. And the mocha whip cream is worth writing home about. "Dear Mom and Dad, ..."
You've stumbled upon my food writing pet peeve-- "whip cream." This is horribly wrong. "Whip cream" insinuates that the substance is the cream from a whip, where as the correct WHIPPED cream means cream that has been whipped. You're so right! I was staring at that word yesterday wondering what was wrong with it. And sometimes I think I mix up food names how it's said in Japanese (totally inexcusable). And obviously it's not clot cream either! My pet peeve - mole "sauce"!